This is WOW News 247: Nigerian Govt Come & Learn How To Fight Corruption - Romanian Ruling Party Leader Jailed For Corruption! Nigerian Govt Come & Learn How To Fight Corruption - Romanian Ruling Party Leader Jailed For Corruption! When you want to fight corruption, you don't do it preferentially as seen in African nations version of anti-corruption war, especially in Nigeria. Thousands of anti-corruption protesters have demonstrated in cities across Romania for a fifth day after a court sentenced the country's most powerful politician for official misconduct. More than 10, 000 demonstrators waved Romanian and European Union flags outside the government offices in Bucharest on Sunday, singing the national anthem and using their smartphone torches to illuminate the night sky. They yelled, "We don't want to be a nation of thieves!" and "Down with the Social Democratic Party!" The leader of the ruling Social Democrats, Liviu Dragnea, was handed a three-and-a-half-year sentence this week for abuse of power in office, and the party has rallied around him, saying he should be considered innocent pending a final verdict. 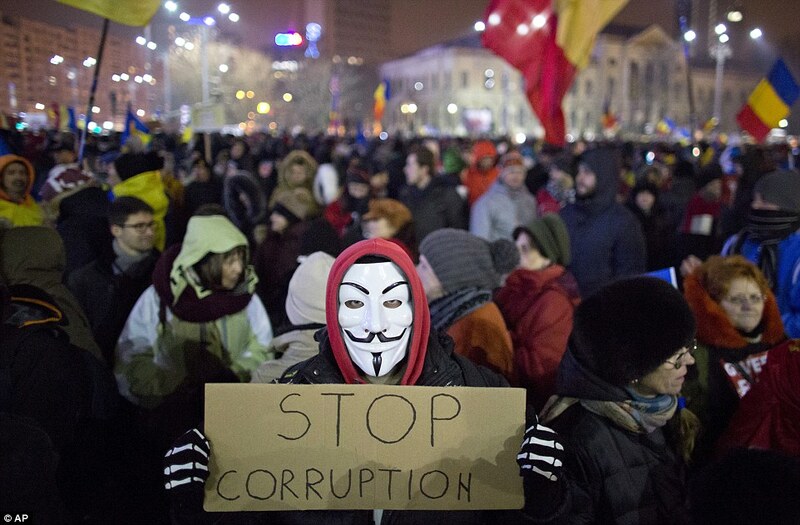 Further angering many Romanians, the ruling party leaders also want to implement new laws that critics say will weaken the nation's fight against corruption. Thousands also turned out in the cities of Cluj, Sibiu, Iasi, Timisoara and Brasov. "We are tired of the government's lies and theft," said Elena Florea, 44, a medical registrar who protested in Bucharest.